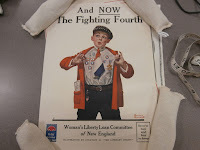 Brandeis University Archives & Special Collections is proud to announce the recent and exciting donation of the Colonel Edward H. McCrahon family collection of World War I posters. Consisting of over 500 of McCrahon’s posters, this collection joins the roughly ninety American WWI posters in the World War I and World War II propaganda posters collection. In addition to the sheer number of new poster images that this donation brings, the McCrahon family collection is particularly special for bringing in non-American posters. This collection was generously donated to Brandeis by the family of Colonel McCrahon. New York auction house Guernseys and the Ettinger family were instrumental in the donation. The posters in this collection differ widely in terms of country of origin, language, message, and physical state. A large portion of the posters are American, though there are a significant number from other countries, including both Allied and Central powers. An initial count shows one Canadian, three Italian, fifteen British, twenty-one German, and sixty-five French posters. The collection includes several additional non-English language posters that were printed in America but directed at immigrant communities. As such, the McCrahon family collection provides a good representation of the propagandistic messages disseminated throughout the War, offering researchers a glimpse into the atmosphere of many of the warring countries. A theme common to almost all of the posters, no matter the language or country of origin, was that of the public’s monetary involvement in the war. 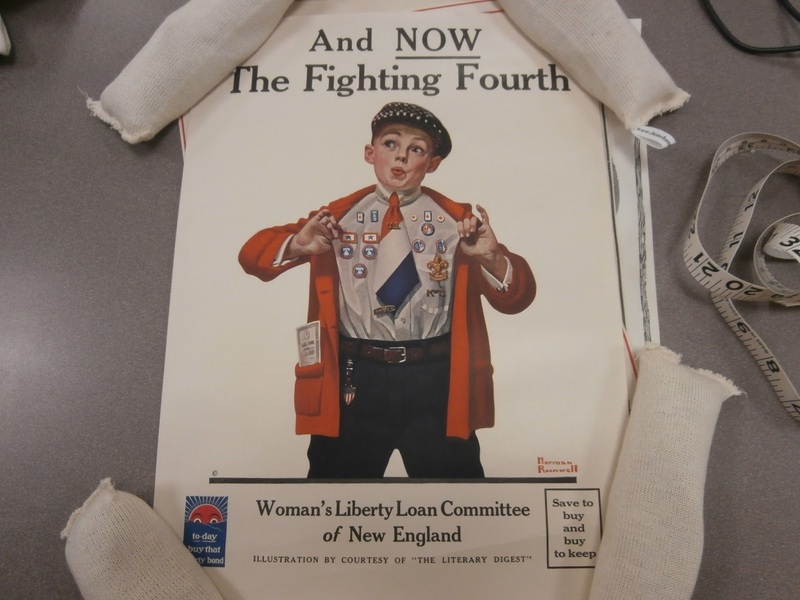 These posters called on the citizens of the various warring countries to support the war financially through the purchase of war bonds and loans. Many German posters in the McCrahon family collection feature the term “Kriegsanleihe,” or “war loan,” similar to the Liberty Bonds and Loans advertised in American posters. 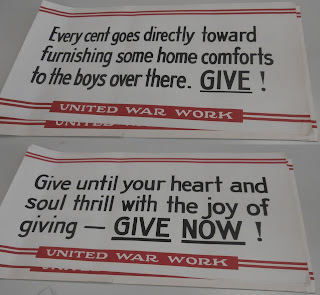 Such poster titles reflect how, around the world, countries motivated and incentivized donations to the war effort. Though at war with each other, the citizens of both Allied and Central powers probably heard a lot of the same messages from their governments. Give money to support your country! The regular and pragmatic message that can be taken from the posters it is that money funds war and that almost everything else must fall in line with that reality. 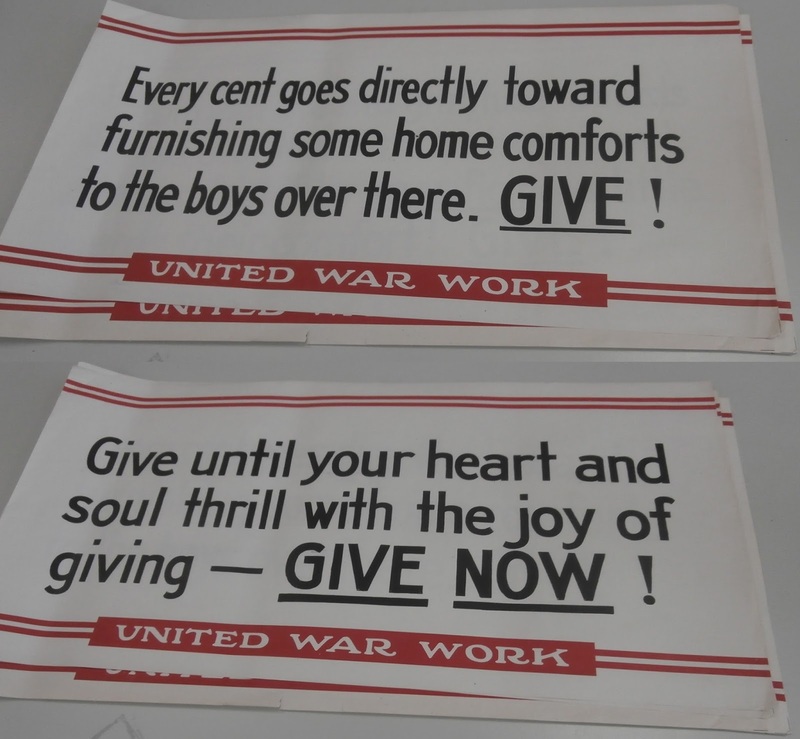 This is apparent in other themes common to many of the collection’s posters: those regarding the need to save food in order to feed soldiers and the encouragement of women to aid in the war effort. The encouragement of women to work was not so much a feminist impulse as it was a pragmatic response to the lack of able men available to work. In other words, it was vital to support the war effort by any means possible. Bearing in mind that the majority of the posters in the McCrahon family collection are American, and a full comparison is not entirely possible, it does appear that American posters generally presented a more threatening attitude than their European counterparts. For example, the American posters tended to portray racist, xenophobic attitudes towards the German people. Consider posters such as “Keep these off the U.S.A.” and “Beat back the Hun with Liberty Bonds” - both suggesting keeping the German people off of American soil. Other images depicting ruined monuments played on the American fear of the European dystopia encroaching on U.S. soil. One such poster, “That liberty shall not perish from the earth / Buy liberty bonds / Fourth Liberty Loan” presents an image of America, specifically the Statue of Liberty and New York City, being engulfed in flames. The poster’s message suggests this disaster to be an inevitability without the American citizenry’s support for the war. As wartime propaganda pieces, the vitriolic, bombastic messages sent through many of these posters is not unexpected, though several posters do indeed look to promote unity among peoples. “Americans All! Victory Liberty Loan” features an ‘honor roll’ of common immigrant surnames. This serves as a call to America’s large immigrant population that they too are Americans, and that they too should be lauded for supporting the war. While most of the French posters join in the effort to raise money, there are several which are noteworthy for exposing the less glamorous aspects of war. They can be viewed in contrast to the American posters, which often expressed a strongly gung-ho attitude and encouraged its Armed Forces to kill opposing soldiers. One French poster offers support to those maimed by war: “Aux Mutilés” depicts men with amputations working for the war effort despite their injuries. Such an image shows the harsher realities of life after service, but it also illustrates the message that the French people can overcome any obstacle. 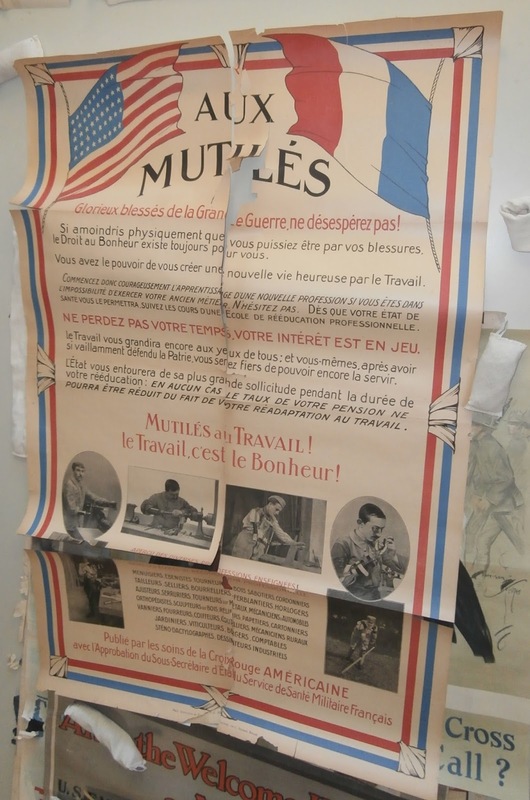 A poster bearing a similar message: “Protection du réformé, no. 2. Assistance aux malades et blessés de la guerre, réformés sans pension. Crédit Foncier de France” [Support for category no. 2 veterans. Aid for the sick and wounded discharged without pension. Crédit Foncier de France] offers to support to soldiers after they return home from the front. These are the only two posters in the McCrahon family collection which consider the soldiers’ post-war fates. Of course, many others incite opposition to the Central Powers. However these two are remarkable for expressing a foresight, or perhaps simply a willingness to acknowledge life after wartime. The images and words used in these posters are intense, forceful, and often incredibly disturbing and frightening. No matter where the posters originated, they were designed to encourage a beleaguered populace to support a violent and costly war; they were intended to bring the citizenry in line with the government’s war-footing. There was no room for gentle encouragement. That being said, the poster images are often stunningly beautiful and were created by some of the best artists of the time - including American artist Norman Rockwell. Whichever the country of origin, WWI poster artists used alluring paintings, telling photos, and shocking text to grab the viewer's attention and to illustrate the messages their governments wanted to impart. The entire collection has been inventoried and the finding aid is in process of being created. Please contact us with any questions regarding the McCrahon family Collection. Description by Archives & Special Collections undergraduate project assistants Rochelle Fayngor (Neuroscience) and Adam Gurfinkel (English and Creative Writing).